It's a history lesson we all need to see. The HBO movie Confirmation doesn’t attempt to side with Anita Hill or Clarence Thomas. Instead, it presents both sides of the politically driven controversy and lets viewers decide if Thomas, who is now a Supreme Court Justice, used lewd and inappropriate conduct or not and how Hill’s accusations forever changed the way Americans view sexual harassment. Kerry Washington of Scandal fame delivers a poignantly understated performance as Hill and Wendell Pierce (The Wire) works hard to turn Thomas into as sympathetic a character as the real man will ever be for most. In time for the Saturday April 16 premiere, here are five reasons to watch Confirmation. 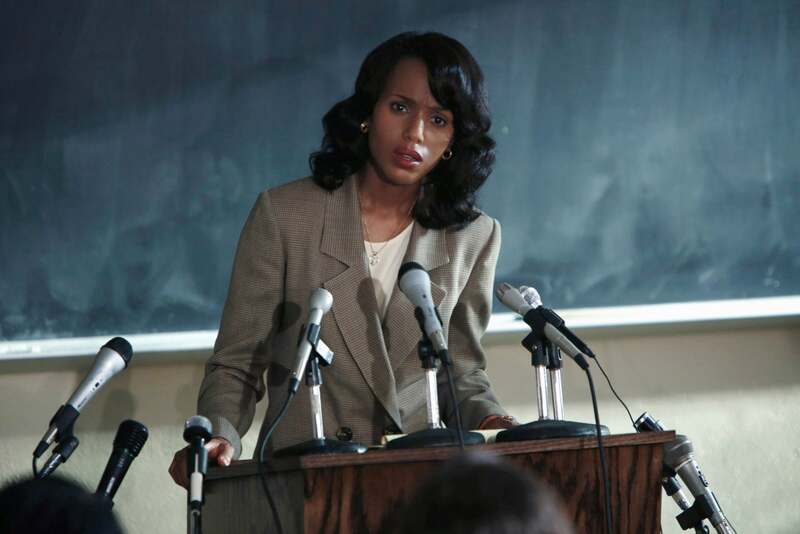 The acting: Scandal fans expecting to see an Olivia Pope-inspired interpretation of Anita Hill will be greatly disappointed. Washington pumps the brakes and proves her range and versatility by adapting a slow-cooked Oklahoman accent and walking with a church lady’s gait. Pierce, in turn, shakes up public perceptions of Thomas by showing him as a loving father who was unafraid to cry. Other noteworthy turns include Jeffrey Wright as Hill’s attorney Charles Ogletree and Greg Kinnear as Joe Biden. Attention to detail: The de rigueur hairstyles and clothes in Confirmation will undoubtedly transport viewers back to 1991. This includes the sea-foam colored, gold-buttoned suit Hill wore when she testified against Thomas. News footage: There will be moments when you’ll want to press pause and Google names like Hill, Thomas and all the other real-life people who played a crucial role during Thomas’ confirmation hearing. Give in. It makes the viewing experience more fun. YouTube footage is also a treat. Other names worth looking up include Judy Smith – the real-life crisis manager who inspired Scandal – and Kenneth M. Duberstein. Pundit commentary and news clips from 25 years ago are included in the film and are incredibly edifying and occasionally humorous. Robert Bork’s senate rejection as a Justice also helps set the historical tone. Little known facts: Over time, most people have probably forgotten or never knew how close Hill was to her large family and that is shown in Confirmation. Meanwhile, Vice President Biden, a former Delaware Senator, presided over Thomas’ confirmation hearing and was accused of being too passive when it came to cross-examining Thomas. Biden also failed to utilize Angela Wright as a witness. In case her name doesn’t sound familiar, Wright is the other woman who accused Thomas of sexual harassment. The timing: There is a revealing clip of the late, great Supreme Court Justice Thurgood Marshall in Confirmation where he says that he didn’t want a Black man to be chosen as his replacement based solely on race. “There’s no difference between a white snake and a black snake. They both bite,” Marshall famously said. Given the climate of this year’s Presidential election, Marshall’s statement couldn’t be more apt. Confirmation premieres Saturday April 16 at 8 pm ET on HBO.